Figure 2.23 Passage of internal waves observed at a stationary observation point. water column against small vertical perturbations: when N is real (a stable water column), buoyant oscillations are initiated; when N is imaginary (an unstable water column), rising or sinking motions are initiated. In a typical stable water column, the buoyancy frequency decreases approximately exponentially with depth with a maximum value (N/2n) of about 10 cycles per hour near the surface and an e-folding depth of about 1.5 km (Spindel, 1985). When present, internal waves can be detected by making continuous temperature measurements at one location (as with a fixed vertical array of thermistors) over a given period of time. Their presence is evidenced by oscillations in the temperature record with periods consistent with those of internal waves. Figure 2.23 shows the passage of internal waves as recorded in the changed depths of the isotherms. Ewart (1996) refined numerical solutions of the fourth-moment equation for acoustic intensity correlations, particularly the temporal cross-correlation between acoustic signals of different frequencies propagating through the same medium. Internal waves are considered to be a limiting factor in the propagation of acoustic energy, particularly in the frequency range of 50 Hz-20 kHz. The effects are manifested as amplitude and phase variations. Internal waves may also limit both the temporal and spatial stability of acoustic paths (Flatté, 1979). Below 50Hz, the relatively long acoustic wavelengths (>30m) are less likely to be affected by internal waves. Above 20 kHz (with acoustic wavelengths less than a few centimeters), the effects of fine-scale features are probably more important. The acoustic impacts of internal waves will be further explored in Chapter 5 (Section 5.6.7). One type of fine-scale oceanic feature is the "thermohaline staircase." These staircases are generally found in the main thermocline and are evidenced by layers of uniform temperature and salinity on the order of 10 m in thickness separated by thin, high-gradient interfaces on the order of a few meters in thickness (Figure 2.24). 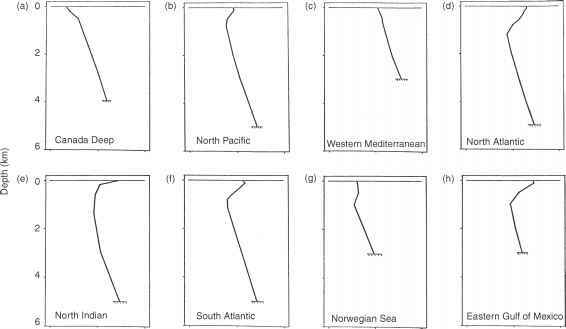 The incidence of well-developed staircases appears to be limited to less than 10 percent of the available high-resolution profiles taken in the North Atlantic Ocean (Schmitt, 1987; Schmitt et al., 1987). 5 9 13 17 21 25 29 0100200300400"